We have some wonderful news we have lots of new pet portraits frames! We are working with a brand new framing company who produces the most beautiful hand crafted frames. The care and attention to detail they take over their frames is stunning. They create each frame from scratch and hand finish them so they are unique. 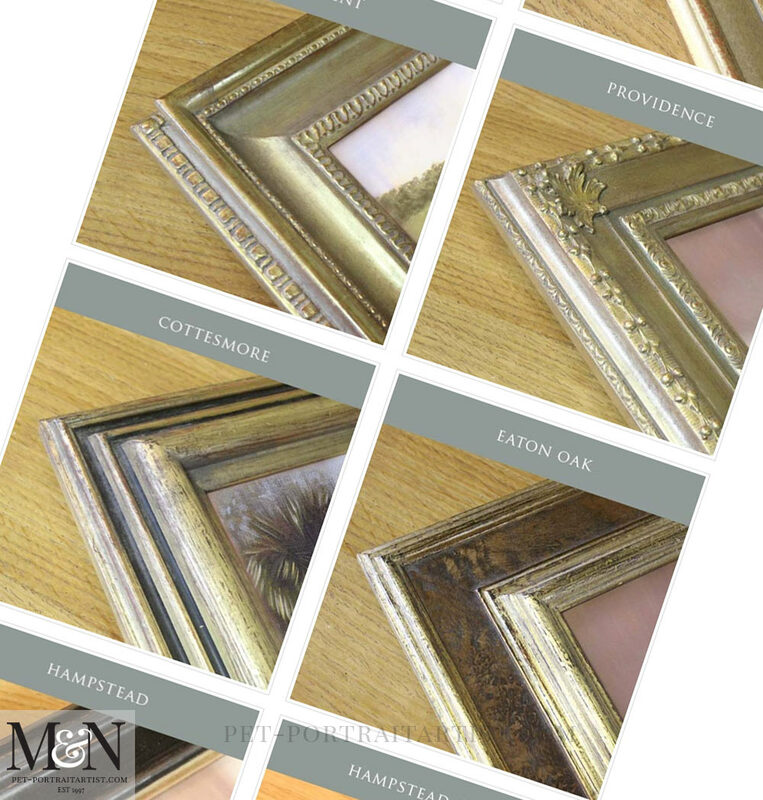 Our framers are artisans with over 30 years of experience, being highly skilled in their craft. You won’t find their frames in any other frame shop in the UK. It is very exciting! I have been in talks with them since last September. However as we were really busy with portraits up to Christmas, I didn’t have much time for making the arrangements. So since January we have been working hard to make things happen! Over the last two weeks I have added lots of photos of the new frames on our website. Consequently, we are very much looking forward to framing plenty of our portraits with them this year. In actual fact we have already framed two oil portraits from our new range!! I will be adding them to the blog in the coming days. You can see a sneak peak of one of the paintings in the Hampstead Framing page already and I have included a video of it below. Each time we have a new frame I am going to try to do a video. This way clients can get a feel for the size of the frame and what it is like. Hopefully a good alternative to just seeing photos. We are unable to add every frame that we can offer to our pet portraits framing section. The choices are endless. However we have taken photos of our favourite mouldings and added a page for each with text about them. This will hopefully enable clients to really see what they are like. If clients see something they like the look of, however want to tweak the design or see something similar, we can send photos of various different mouldings to choose from. Just let us know your ideas! We hope you have enjoyed reading about our new pet portraits frames. 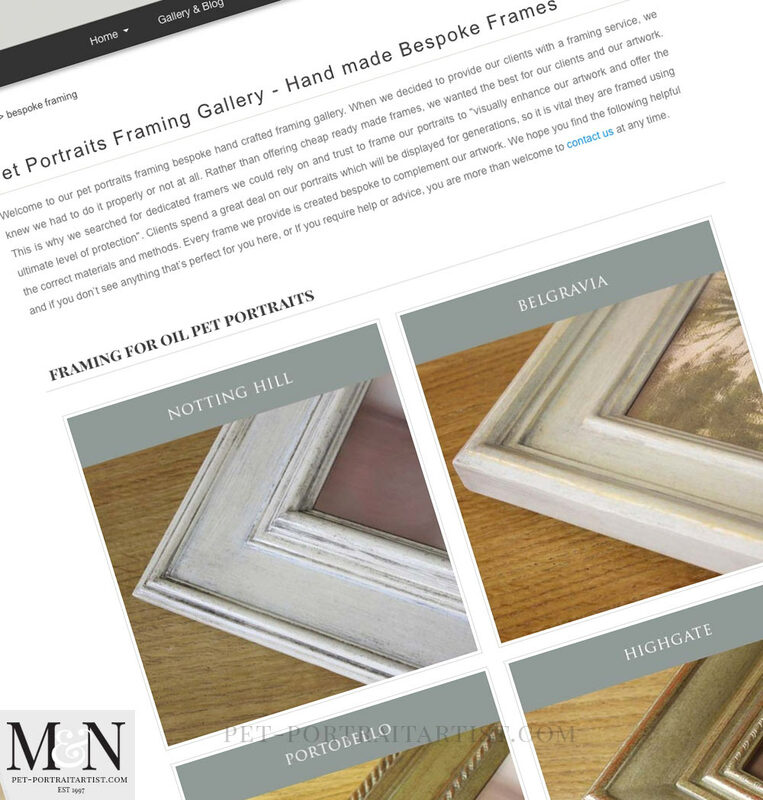 Finally, why not pop on over to our framing options page to read more about our service. Take a look at our new range from our top navigation. If you see something you like the look of, drop us a line!